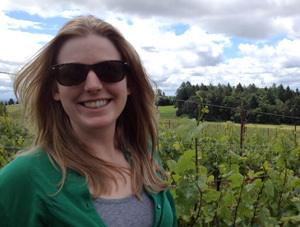 Dreer Seminar Feb. 4: Cool-season viticulture in N.Z. 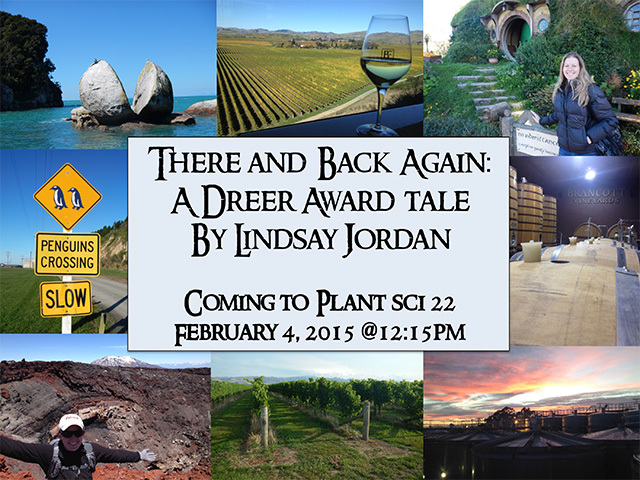 Lindsay Jordan (MS ’14) will deliver her Dreer Award seminar detailing her recent adventures exploring cool-season viticulture in New Zealand February 4 at 12:15 p.m. in Plant Science 22. The Frederick Dreer Award, administered by the Horticulture Section of the School of Integrative Plant Science, funds one or more students to spend 4 months to up to a year abroad pursuing his or her interests related to horticulture. See the instructions that spell out the applications procedure. Basically it is quite simple. Submit a written proposal to the Dreer Committee by the deadline (March 2, 2015 in this cycle), which is followed by an informal interview, generally in a week or two. The horticulture faculty receive the recommendation of the Dreer Committee and vote on the nominee. This video was created by Eric L. Gasteiger, Videographer/Producer for Cornell University Communications (Marketing) during the November 2014 flowering of Cornell’s Titan Arum, ‘Wee Stinky’ — part of the Plant Biology Section’s Liberty Hyde Bailey Hortorium collection. Gasteiger shot the overhead video with a GoPro camera suspended in the rafters of the greenhouse, syncing it with the ground-level time-lapse created from still camera shots by Craig Cramer, communications specialist in the School of Integrative Plant Science. 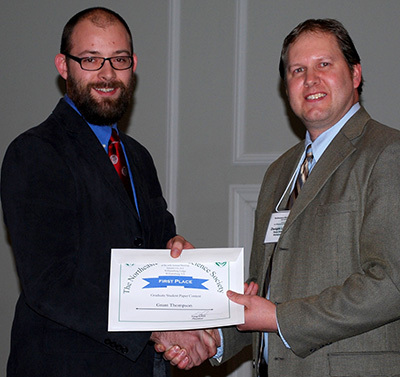 Horticulture PhD student Grant Thompson (Kao-Kniffin Lab) won best graduate student presentation (out of 18 entries) place at the 69th Annual Meeting of the Northeastern Weed Science Society (NEWSS) January 6 in Williamsburg, Va. Thompson’s talk was titled “Investigating the effects of Pale Swallowwort (Vincetoxicum rossicum) on soil microbial processes.” Congratulations Grant! Eye on the next generation: New Ag Station director looking toward the future [Finger Lakes Times 2015-01-19] – When people bite into an apple, slice a tomato or sip a glass of wine, Susan Brown hopes they will remember the local research that may have made it possible. Hard Cider a Big, But Complex, Opportunity [Lancaster Farming 2015-01-17] – Millennials, the current generation of young adults, are driving the hard cider boom. They are more willing than previous generations to spend money on good food and alcohol, said Ian Merwin, a Cornell University professor emeritus and owner of Black Diamond Farm in Trumansburg, N.Y.
Internships are for Cornell students only, and are designed for students with an interest in fruit crop production and physiology. 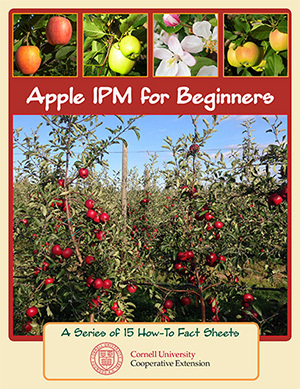 Apple IPM for Beginners is a new series of simplified factsheets and scouting guides that make integrated pest management easier for beginners. 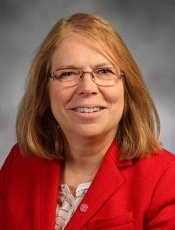 Deborah I. Breth, Cornell Cooperative Extension Lake Ontario Fruit Program edited the publication with contributions from CCE educators, growers and others. A Cornell-U.S. government research team is poised to transform the shape of trees and orchards to come, thanks to a $1.5 million grant from the National Science Foundation Plant Genome Research Program. The project, “Elucidating the Gene Networks Controlling Branch Angle and the Directional Growth of Lateral Meristems in Trees,” is led by Kenong Xu, assistant professor of horticulture at the New York State Agricultural Experiment Station in Geneva, and plant molecular biologist Chris Dardick and research engineer Amy Tabb from the U.S. Department of Agriculture’s Appalachian Fruit Research Laboratory in West Virginia. The research team is seeking to uncover genes and gene networks that underpin how apical control – the inhibitory effect on a lateral branch’s growth by the shoots above it – influences branch growth in apple and peach trees. 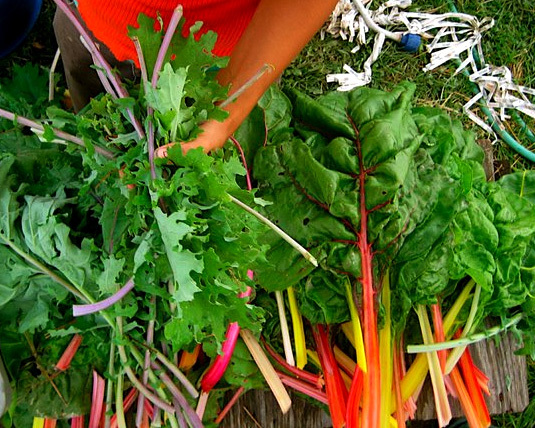 Just in time for arrival of this year’s crop of seed catalogs, the 2015 edition of Selected List of Vegetable Varieties for Gardeners in New York State is now available online. Best of luck with your 2015 growing season. Research and extension at Cornell’s New York State Agricultural Experiment Station —Cornell’s Geneva campus — is addressing challenges and opportunities in specialty crops. We are an integral part of the College of Agriculture and Life Sciences, and our faculty have academic homes in the departments of Entomology and Food Science and in the sections of Plant Pathology and Plant-Microbe Biology (PPPMB) and Horticulture in the School of Integrative Plant Science (SIPS). Our primary focus on fruits and vegetables is complemented by research and extension on additional key plants, including turfgrass, biofuel willow and hops. From investigating and mitigating new diseases and insects, to developing new varieties, or perfecting a food or beverage formulation, Cornell scientists at Geneva have enthusiasm and passion for projects that benefit growers and consumers alike. Our goal is to produce better food, from almost every aspect imaginable—new varieties with better nutritional quality, better eating quality and resistance to diseases as well as better products from the raw ingredients. 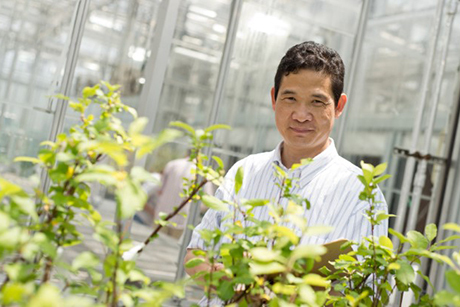 Our scientists also work to develop growing systems that maximize quality in the field, orchard and vineyard; sharing these techniques with growers produces a superior product for consumers to enjoy. Several of our programs work directly with growers and entrepreneurs and to troubleshoot their individual problems. The Food Venture Center helps entrepreneurs develop safe new products, the New York State Wine Analytical Laboratory aids producers in solving problems, and our Good Agricultural Practices Program (GAPS) teaches producers to meet and exceed food safety standards for handling produce. Growers, producers, entrepreneurs, established businesses and consumers benefit directly from our expertise. 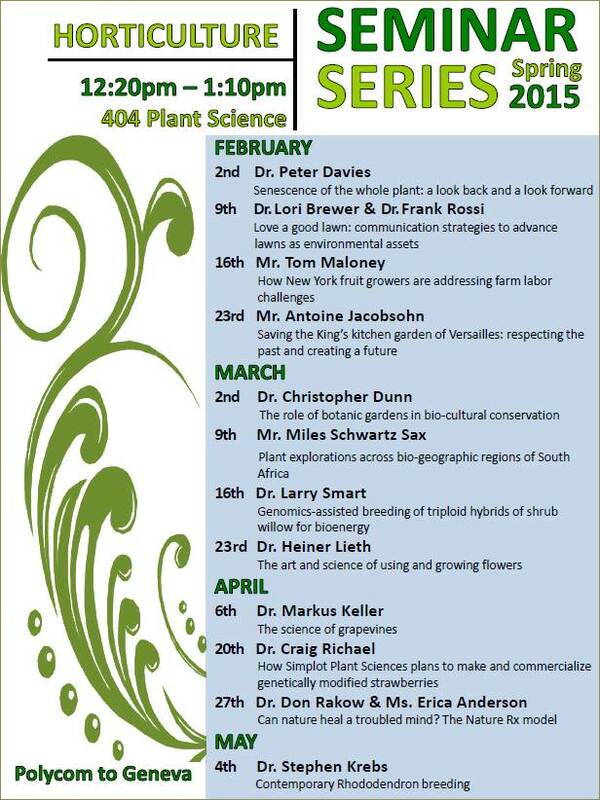 Peter Davies, professor, Plant Biology and Horticulture Sections, School of Integrative Plant Science, Cornell University, will kick off the Spring 2015 Horticulture Section seminar series February 2 with a talk on Senescence of the whole plant: a look back and a look forward. This semester’s seminar series will feature wide-ranging topics from lawns and farm labor to historic gardens and shrub willow breeding. Horticulture seminars are free and open to all and meet 12:20 to 1:10 p.m. most Mondays when classes are in session in Plant Science Room 404 and via Polycom to Geneva in A134 Barton Hall. (Refreshments served.) Those wishing to take for 1 credit, enroll in HORT 4950 (undergrads) or HORT 6000 (grads). In additions, there will be two SIPS-wide seminars this spring: Ed Buckler, USDA-ARS plant geneticist on January 28 and Giles Oldroyd, John Innes Centre, Norwich UK on April 15.